Assess student understanding of pre-algebra and geometry concepts with these math worksheets for middle school students. Worksheets labeled with are accessible to Help Teaching Pro subscribers only. Become a Pro Subscriber to access hundreds of standards aligned worksheets. Don't see a printable you need? Use our Test Maker™ to create your own printable that fits your needs. Browse middle school math questions or use our advanced search to find existing questions while filtering by grade levels and keywords. Use these Number System, Pre-Algebra, and Algebra tests to gauge student comprehension of middle school math topics including: expressions and equations, inequalities featuring number line graphics, functions, exponents, and radicals. Sale! - Finding Sale Prices new! Slope-Intercept Form: Finding Slope new! 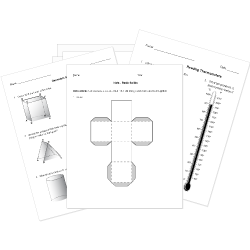 Investigate lines, angles, circles, triangles, polygons, perimeter, volume, and the coordinate plane, among other topics with these geometry worksheets. Polygons in the Coordinate Plane new! Develop student understanding of statistical thinking and probability concepts with these worksheets designed for students in grades 6 – 8. 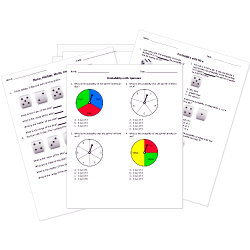 Grade 6 Statistics & Probability Review new! Grade 7 Statistics & Probability Review new! Grade 8 Statistics & Probability Review new!